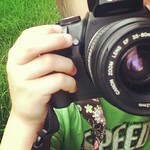 CraftyRahRah | craft, kids and crazy. Do you Instagram? I am completely addicted! Well don’t weekends always go by too quickly? I feel like I barely blink and all of a sudden it’s Sunday night and we are getting organised for the school routine to start all over again. I have been fairly busy with uni lately and crafting hasn’t been at the top of my list of things to do, but every now and then you need to take a bit of time out from reading and essay writing to do something fun. Yesterday, I was lucky enough to get a lesson in dressmaking from my lovely and very talented friend Emma. I’m a visual learner and I find it so much easier to have some hands on help. 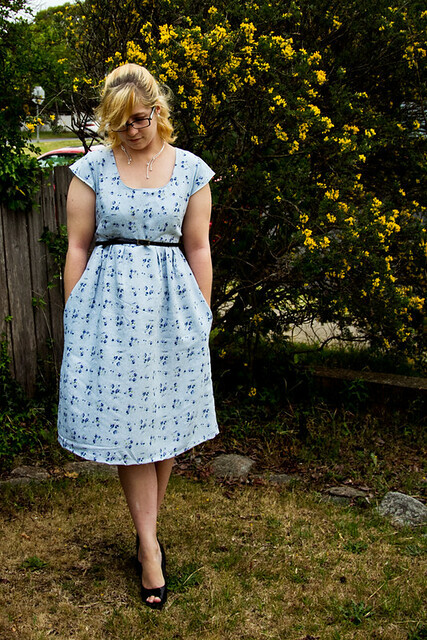 We chose the Washi Dress from the fantastic Made By Rae, and some fabric I picked up at an op-shop. Despite my fears and reservations, about 4 hours later, I had a dress! Pancakes are a magic food aren’t they? They can be breakfast or dessert. Or sometimes even lunch. You can eat them hot or cold, add just about any topping you fancy, make them thick, thin, sweet, savory, lots of them or just a few. 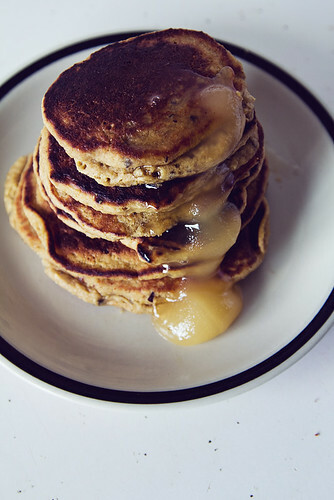 All my life I had only ever known pancakes to consist of two main things: Flour and milk. But since starting my allergy cooking journey I have experimented with quite a few variations on the traditional pancake recipe with mixed results. However today I think I have created a winner. There’s no expensive or specialised gluten free flours so anybody can whip them up for a gluten free house guest. They’re sweet, moist and filling. They must have been good, because I barely had time to take photos before they disappeared into little boy’s tummies. Note: I made this in my Bellini Intelli Kitchen Master but you can whip them up in any blender. With chopping blades in the bowl, add diced apple, cinnamon, mixed spice and sugar. Pulse a few times to chop it all up. Add soy milk (or coconut), rolled oats, eggs and baking powder. Mix for 2 minutes on speed 7 or until mixture is well combined. Pour mix into a frying pan as per normal pancake method, and cook with your favourite non dairy spread (I use Nuttelex). Enjoy while hot with your favourite toppings. I prefer natural honey. Well here we are in September already. The sun is shining, flowers are blooming, birds are singing. Winter seemed like a long one this year and I am so glad to see some warmer weather. In a small saucepan, dissolve the caster sugar into the water, then place into the fridge to cool. 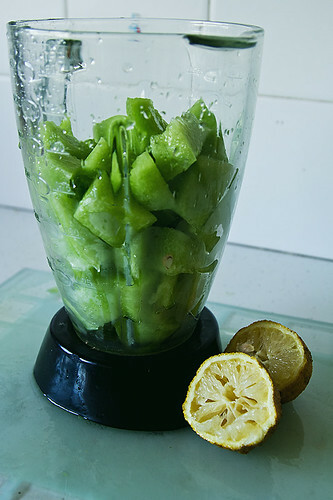 Then cut your melon into cubes and place into a blender with the juice of 1 lemon. 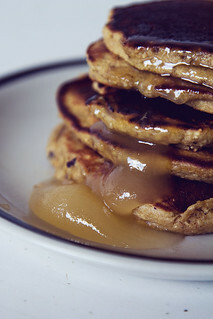 Once your syrup mix has cooled, add it to the blender and give it all a whizz until it’s nice and smooth. Pop it back into the fridge for 20 minutes or so to give it an extra chill. 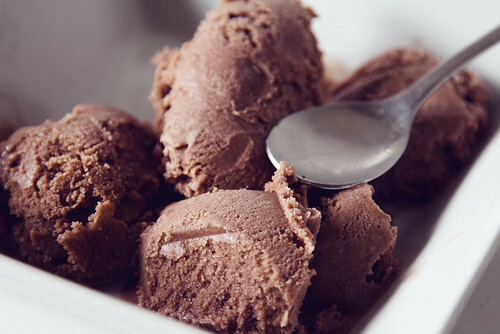 Once it’s nice and cool, add it to your ice cream maker bowl. I have small Cuisinart and I love it. That’s it! 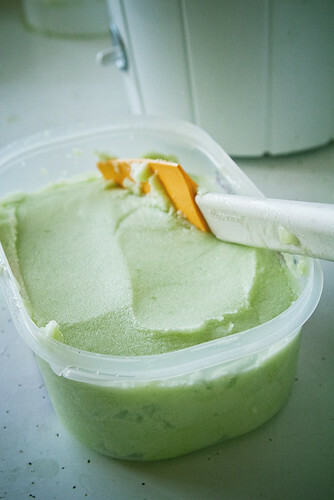 All that is left to do is enjoy your delicious, allergy free sorbet! This recipe made a litre of yummyness. Transfer the rest to container and store in the freezer. “It’s called Eosinophilic Oesophagitis”. The Gastroenterologist sat next to me in scrubs, holding a piece of paper which had the images from my son’s endoscope printed on it. I didn’t have a medical degree, but I could tell that it looked painful. The words entered my brain, but there was no reference point so they just bounced around with no meaning. I had never even heard of that before. What does it mean? “It happens sometimes when the body reacts to a protein, and attacks the food instead of digesting it”, he explained further. “You can see here where the oesophagus is quite swollen, this means that food is not getting into his tummy properly”. “Oh” was about all I could manage in reply. He smiled and told me not to worry; he would give me more details when he was done in surgery for the day. He left me with the pictures and disappeared back into theatre. I sat in the corridor of John Hunter Children’s Hospital trying to process the new information. It had taken 3 years, 4 different doctors and a 400km drive to finally get here in our search for answers. Now it seemed that the answer had simply given us more questions. As I waited for Lachlan to wake up from the general anaesthetic I tried to take a few deep breaths and relax. He had said not to worry, he was happy we had an answer. I rang my husband to let him know how it had gone. I spelled it out over the phone: e-o-s-i-n-o-p-h-i-l-i-c … Gosh, this sounds as though it might be something serious. Then the anaesthetist came to tell me Lachlan was waking and I could go into recovery to see him. He looked so fragile, laying in the hospital bed with no awareness of what was happening. As he began to come around he became distressed and disoriented. I tried to hold him but he kept pushing me away. His throat hurt from the procedure and he kept gagging and saying he couldn’t swallow. It’s in moments like these as a mother that you question whether putting your child through an ordeal like this is really worth it. It took at least an hour before Lachlan was feeling himself again. Some jelly and a trip to the Starlight Room had done the trick. After lunch, our gastroenterologist returned to talk some more about this condition I had never heard of. I had been trying my best to pronounce it in my head but I was sure I was getting it wrong. He explained that eosinophils are a kind of white blood cell the body produces to fight bacteria and parasites. For an unknown reason, people with eosinophilic oesophagitis produce a large number of these cells in the digestive system when having a kind of allergic reaction to certain foods. This in turn results in swelling and pain. We had already suspected that Lachlan might be lactose intolerant, so we were half way onto the right track. However EoE or EE, is a reaction to the protein components of food specifically, so we would need to stop all milk products not just lactose. He gave us a few fact sheets, made a date for a follow up visit and the next day we travelled 400kms back home again. I was right, our trip in search of answers had become a trip of even more questions. Lachlan was 7 and a half. He is an extremely intelligent boy and has always been ahead on the learning development scale. He was a happy, laid back baby. He hardly ever cried, he grew at a normal rate, I breastfed him for 2 years with no issues whatsoever. By the time he was 2, he had been hospitalised twice for severe asthma. By the time he was 4, it had become pretty apparent that he was a picky eater. By age 5 when he started school, we knew he was smaller than most boys his age. By the time he was 6, we knew something was really wrong. He was no longer growing at all. He would hardly eat a thing. Meal times were drawn out, stressful ordeals of trying to force him to swallow every mouthful. He would complain about not liking things to the point of gagging and vomiting. We took him to our Paediatrician who tested him for Coeliac Disease. The blood tests showed that he did not have any of the usual serum indicators for coeliac, but he did have low levels of Immunoglobulin A; a protein related to eczema, asthma, allergies and mucous in the gut. So at this point, we were advised against an endoscope. Time went on, and it became more and more evident that something was not right. He became lethargic, he still would not eat. He still would not gain weight. When he reached 7 and half years old, and only 18.7kgs in weight, we were finally referred to Newcastle for the endoscope. I thought about all of this on our drive home. Why had it taken so long? How could I have missed all these signs? It was like I had been staring at a jumbled up puzzle, and now all the pieces were almost locked into place. So naturally, the first thing I did once I was home, was to google it. And the more I googled, the more confused and overwhelmed I became. It’s not as simple as he is allergic to Food A or Food B. EE kids can be allergic to many foods. In fact, they are almost always reactive to more than one and no two cases are the same. The condition causes a large amount of pain and discomfort, from something as simple as eating a sandwich. Can you imagine that, being doubled over in pain from an act so basic as eating? This was quickly becoming terrifying. It is not uncommon for EE kids to require nasal feeding tubes or gastro PEGs for nutrient based feeding because there is so little food they can eat. And then I discovered an invaluable help. I stumbled upon AusEE, “a charity dedicated to improving lives affected by eosinophilic disorders”. I was ecstatic! I was even happier to discover they also had an online support network. I cannot tell you how relieving it was to be able to speak with people experiencing the same thing; people who didn’t stare at me like I was speaking Klingon as soon as I said the word ‘eosiniphilic’; people who have also had to fight to get answers and face the pain of watching your child struggle to eat. The resources, support and help that I have gained from AusEE can’t be measured. It has made dealing with a strange and scary condition so much easier. So to celebrate National EOS Awareness week 2012, I share our story with you. I also urge you to donate to raise funds and support this amazing network. Our journey with EE is far from over. In fact, it will never be over. But Lachlan is doing much better. We are still experimenting with foods, and in general he is feeling great. It’s a long complicated road, but thanks to AusEE, we don’t have to walk it alone. We are into the second half of the winter holidays here. The weather is miserable, uni has already started so I have been busy with that and cabin fever is well set in. We needed an activity to entertain us all that didn’t involve electronic screens which in my house can be a challenge at times like this. The lego has been getting a fairly good work out so far but there is only so much lego you can build, even if you are a smallish to medium sized boy. 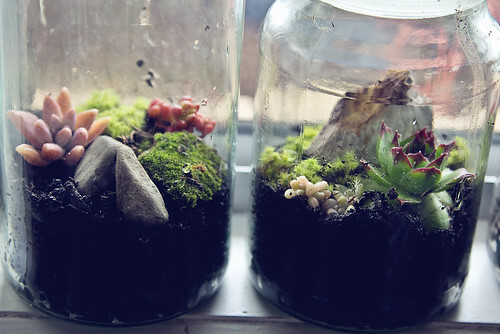 So I decided we would make some miniature terrariums. 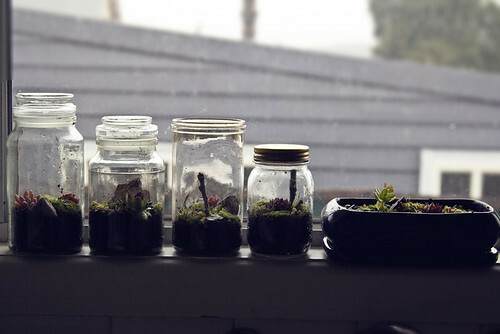 I have long adored terrariums. 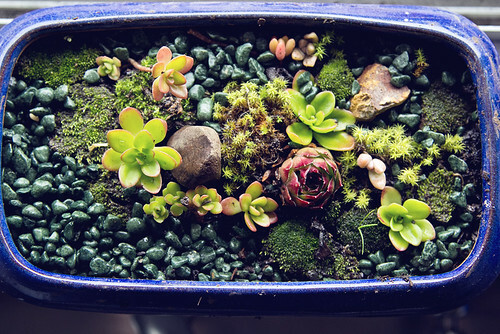 When I was a small girl I used to love making ‘fairy gardens’ in ice cream containers. It has been on my list of things to do for years but, well, you know how it goes with me. That list is LONG. 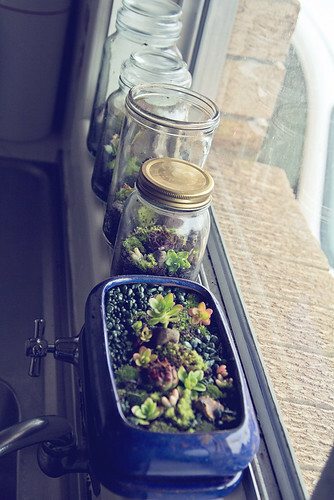 So anyhoo, I had some jars put away just for this purpose. The two with glass stoppers are coffee jars, the other two I picked up at an op-shop. Yesterday we made use of some less-yukky-than-usual weather and collected some moss and succulents from my aunt’s garden. 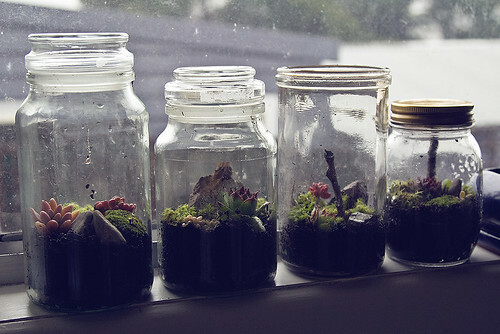 The boys had fun being creative and arranging their mini-worlds and I think they did a pretty good job. We also had enough stuff left over to fill a pot I found in my garden shed that I had bought one day, in the hope of starting a bonsai (like I said, the list is long!). For now, they are living on my kitchen window. 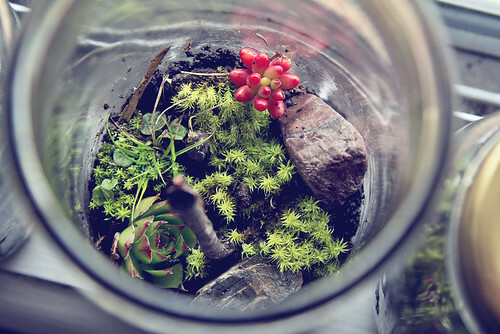 And I will leave you with a quote from Tasman: “The best part about terrariums, is imagining being tiny enough to live in one”. I know you might think I am crazy, but I bought an ice cream maker, in winter. I had wanted one for ages, and when my local kitchen store had a big sale, I couldn’t resist. Now, before you send me to the loony bin let me explain. As I mentioned in my last post, my eldest son has been diagnosed with a condition called Eosiniphilic Oesophagitis. It was something I had never heard of until it directly effected our family, but has turned our life upside down. Kids (and adults) who live with this condition have a very hard time trying to eat. Proteins in food cause the body to produce white blood cells and attack the food instead of digesting it. All of this can be terribly painful. Living with EE means strict elimination and experimental dieting, daily medications, invasive endoscopes and sometimes even tube feeding. So far, we are doing ok. But finding things for Mr. L to eat has become quite a challenge, given that he was a very fussy eater to begin with (and when eating causes you pain, who can blame him really?). So back to the ice cream maker. Have you ever noticed how many ingredients there are in ice cream? Gluten, soy, enormous amounts of sugar.. I was amazed. 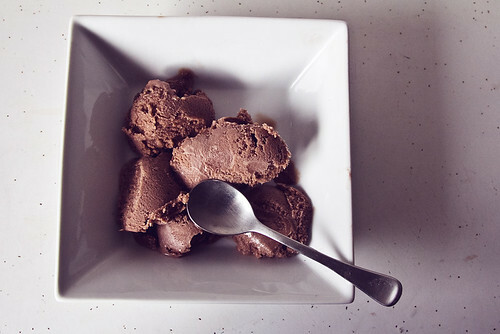 Ice cream has been something our family always had as a treat, so replacing it has become quite the challenge. There is soy ice cream in the supermarket, but it is both very expensive and not very nice. So I have set about making our own allergy free sweet treats, with great success. 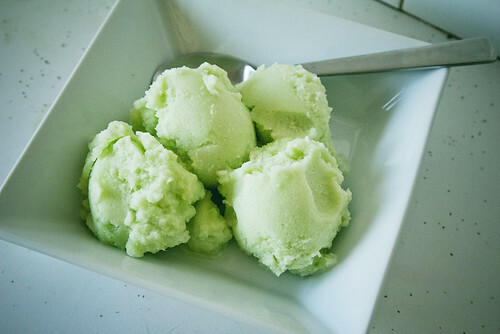 I have been making a few sorbets, and yesterday began to experiment with coconut milk because along with Mr. L not being able to eat dairy, I have a soy allergy. The experiment worked, so here’s the recipe. This recipe is also husband approved. Dissolve sugar in water over a low heat, and allow to cool. Add bananas, coconut milk and cocoa powder to a blender and blend well. Add the syrup mix to the blender and chill in the fridge (approx. 1hr). 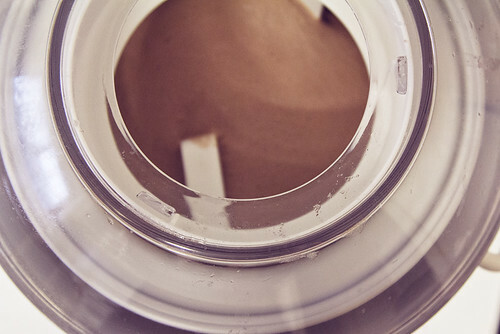 Add the mix to your ice cream maker following the manufacturer’s instructions. 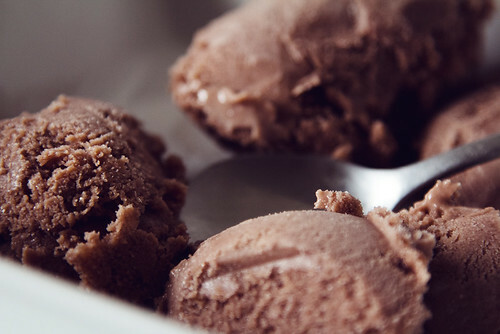 The hardest part about making ice cream, is waiting for it to be ready. Then enjoy your delicious sweet treats! If you would like to know more about EE/EGID, please visit The CURED Foundation.